Downtown Line 3 will be finally be opening on 21 October 2017! 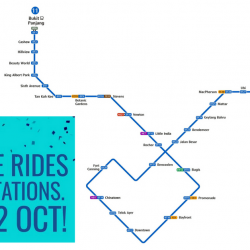 To celebrate this milestone, everyone gets FREE rides on the entire Downtown Line on 21 and 22 October 2017! Your journey must start and end at any of the 34 DTL stations, i.e. along DTL1, 2 and 3 to qualify as a free ride. Tap in and tap out as usual at any fare gate and no fare will be deducted. If you are transferring to or from another line at most interchange stations (Bugis and Expo stations on the East-West Line; Chinatown and Little India stations on the North East Line; and Bayfront, Botanic Gardens, MacPherson and Promenade stations on the Circle Line), you can tap out and then in again, to enjoy free travel for the DTL leg. 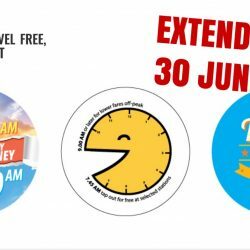 Extended till 30 Jun 2017 Free early morning MRT rides EXTENDED! Good news! Free early morning MRT rides to 18 designated MRT stations* in the city area before 7.45am on weekdays (excluding public holidays) has been extended till 30 June 2017. For those who miss the cut-off timing for free travel by a few minutes, you can still enjoy 50 cents off your train fare if you exit at any of the 18 stations* between 7.45am and 8.00am on weekdays (excluding public holidays).